This entry was posted in Oral Surgery and tagged arch bar, cap splint, deciduous dentition, greenstick fracture, miniplates, osteosynthesis, permanent teeth, resorbable plates, tooth buds, wiring on March 31, 2012 by chzechze. This entry was posted in Baby Teeth, Teeth Extraction and tagged baby teeth, crowding, eruption, extraction, filling, permanent teeth, pulp, pulpotomy, space maintainer, splinting on March 16, 2012 by chzechze. This entry was posted in Oral Care, Uncategorized and tagged abscess, bleaching, caps, Dentinogenesis imperfecta, enamel, osteogenesis imperfecta, permanent teeth, primary teeth, sealants, veneer on February 21, 2012 by chzechze. This entry was posted in Oral Care and tagged bone fragility, brittle teeth, Dentinogenesis imperfecta, fluoride, opalescent teeth, osteogenesis imperfecta, permanent teeth, primary teeth, sand abrasion method, skeletal class III malocclusion on February 19, 2012 by chzechze. This entry was posted in Baby Teeth and tagged anterior teeth, caninces, eruption dates, incisors, milk teeth, molars, permanent teeth, posterior teeth, premolars, primary teeth on February 2, 2012 by chzechze. This entry was posted in Teeth Extraction and tagged dental tooth extraction, dentition, permanent teeth, primary teeth, teeth extraction, teeth extraction techniques, tooth extraction, wisdom tooth on January 11, 2012 by oileng. This entry was posted in Baby Teeth, Braces, Denture, Oral Care, Orthodontic and tagged anterior space maintainers, band and loop, braces, crown and loop, distal shoe appliance, lingual arch, nance palatal holding arch, permanent teeth, primary teeth, space maintainers, transpalatal arch appliance on October 23, 2011 by joann. This entry was posted in Baby Teeth, Endodontic treatment, Oral Care and tagged baby teeth, calcium hydroxide, caries in children, indirect pulp cap, irreversible pulpitis, permanent teeth, primary teeth, pulpectomy, pulpitis, pulpotomy, root canal treatment, tooth decay on October 17, 2011 by joann. We have two sets of teeth in our lifetime. 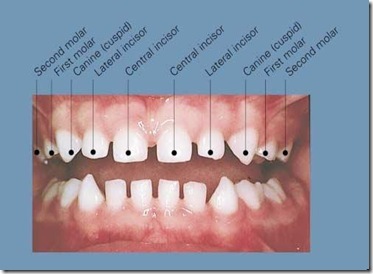 The first set of our teeth is known as deciduous/primary/milk/baby/temporary teeth. There are a total of 20 teeth in the oral cavity/mouth. This entry was posted in Baby Teeth, Oral Care and tagged baby teeth, deciduous dentition, mammelons, milk teeth, permanent teeth, primary teeth, wisdom teeth on September 29, 2011 by meifong. This entry was posted in Oral Care and tagged aneasthesia, baby teeth, bleeding, floss, forceps, gauze, gums, permanent teeth, surgical removal on August 22, 2011 by chzechze.